Remember when Rod Stewart’s “Unplugged … and Seated!” CD came out? It was a great record because he reunited with Ron Wood and stuck mostly to music from their time together in the Faces. That was a good call, because pretty much everything Stewart recorded after 1976 was self-parody, with the exception of “Young Turks” and his 1983 collaboration with Jeff Beck. 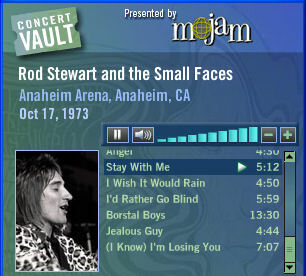 Which leads to today’s Wolfgang’s Spotlight, a Faces show recorded in Anaheim, California in the early stages of their 1973 tour, the first without longtime bassist Ronnie Lane. The live album “Overtures and Beginners” came from this show, but it’s been out of print for years. This Wolfgang’s stream contains the entire album, plus “(I Know) I’m Losing You.” It’s a good glimpse of Rod before he sucked. Enjoy! Note: Wolfgang’s Vault registration required to stream FREE concerts. The list of portable devices capable of streaming Rhapsody Channels grew by one the other day, as the iRiver Clix debuted via a joint press release. At first glance, it’s a bit different from the Sansa Rhapsody. The Clix has a 4 GB solid state drive, but no SD expansion slot. It supports multiple file formats, including (unlike the Sansa device) OGG Vorbis. It has a bigger video screen, which is nice. Like the original Clix, there’s no buttons; the face is almost all video screen, with the surrounding edges used for left,right,up and down navigation. The best feature is, of course, full integration with Rhapsody, including their Channels feature which enables on-the-go discovery of new music. I’ve had a Sansa for nearly a year now, and the Rhapsody portable interface is far and away the easiest one I’ve seen. When I hear a Channel song I’d like to keep, I simply press and hold a button and it saves it, later syncing it to my PC. My only complaint is that there’s still no way to look back at songs that have already played. If I have the device hooked up to speakers while I’m elsewhere, that’s a problem. A history list would be a great addition. Other than, that, I love Rhapsody. 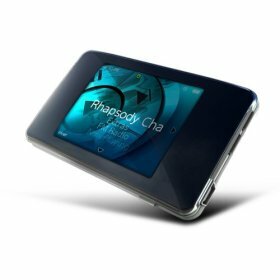 To their credit, iRiver wrote code to make the Rhapsody integration backwardly compatible to other second generation iRiver Clix devices; the firmware is a free download on the iRiver website.